Excursion tips in Liguria at the Italian Riviera. Let the beauty of Liguria bewitch you. This is a small compilation of excursion destinations that you should definitely visit: the exotic gardens of Villa Hanbury, the most beautiful and largest aquarium in Europe, villages and cities in which the time appears to have stood still since the middle-ages. Enjoy Liguria’s four seasons, enjoy a special holiday. We are looking forward to your arrival. The Cinque Terre National Park is absolutely a must see. No visitor can resist the charm and atmosphere of the five coastal towns of Manarola, Riomaggiore, Corniglia, Vernazza and Monterosso. The colourful, old-fashioned and romantic houses within the villages are world famous. 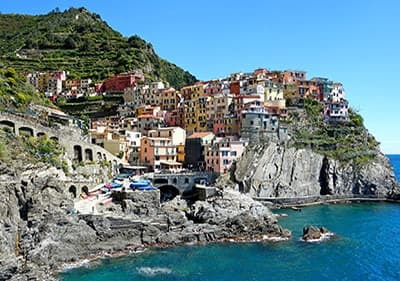 The beautiful hiking trails around the Cinque Terre attract many tourists and locals. The small villages can be reached only by train or boat. A small town whose church is its landmark. The town nestles picturesquely in the countryside and invites you to take a walk through its narrow, winding streets and visit one of the idyllic bars and restaurants. In the old town you can purchase crafts and antiques. Cervo is famous for its chamber music concerts which are of an international standard. Isolated from the hustle and bustle of the harbour city of Imperia lies the picturesque town of Valloria. 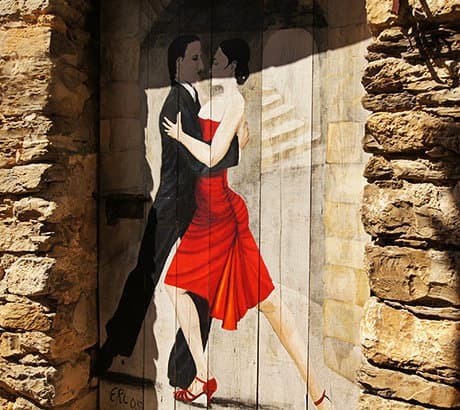 All over Valleria, called “Il paese delle porte dipinte” (the town of painted doors), one can expect to be astonished by the wonderful artistry on doors and walls. During the first weekends of July and August, the summer festivities of Valloria take place, which have really become legendary. Enjoy delightful Ligurian gastronomy and the hospitality of the residents. Badalucco is a typical old Ligurian village in the Argentina Valley. In this fortified town you can admire traces of its mediaeval past, like the bridge and the gates of San Rocco, Poggetto, Beo, Castello and Santa Lucia. The castle, Palazzo Boeri and the church San Nicolò are definitely worth seeing too. Badalucco is also an ideal starting point for hikes and a great place from which to see local sites. Dolceacqua is a mediaeval picturesque village in the Nervia valley. It is situated on the River Nervia and the two parts of the town (Terra and Borgo) are connected through a beautiful humpback bridge. In this village the mediaeval atmosphere is so perceptible that you could forget that you are living in the 21st century! Here you can also taste delicious culinary specialties like the michetta and appreciate the high quality of the typical red wine called Rossese di Dolceacqua. Apricale is a medieval artist's town located in the hinterland of Ventimiglia. Located on a steep slope, the houses look almost as if they might tumble down the hill, but they have now stood there safely for 700 years. Lining the small alleys of the town are many murali (murals), which are well worth seeing. The heart of the town is the Piazza Vittorio Emanuele, from which there is a wonderful panoramic view of the Neriva Valley. Throughout almost the whole year there are theatre performances, classical concerts and the well-known art show Castello della Lucertola. Discover the Ligurian hinterland on horseback! With Mulino Martino you can experience a different excursion every day: beautiful rural paths, breath-taking landscapes and mountain peaks are waiting for you! Also, courses for beginners are organised by Mulino Martino as well as interesting activities for children so that they can get to know the horses and learn how to ride them. The old mountain town above San Remo was destroyed in an Earthquake. For years the town lay in ruins, overgrown with vegetation, until the sixties, when artists came here and lovingly rebuilt the town under their own direction. Only a few walls remain of the old Bussana Vecchia. Today the town is full of artwork and is renowned throughout Europe for its colourful buildings and surroundings. There are many ways to explore the Arroscia Valley; the two most common are by motorcycle/ car, or on a mountain bike. The valley has many towns just waiting to be discovered, all of which have something unique to offer, such as the San Lorenzo Church. 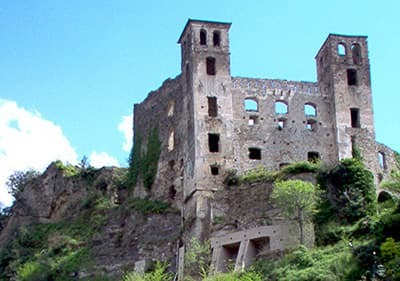 A special recommendation can be made for the open-air art show “I megaliti del terzo millennio” of Rainer Kriester from 1982, located near Vendone. Here you will find 4-metre-high stones that are arranged to form a picture of stars. And beside the wonderful art, there is a breathtaking view of a part of the valley all the way to the sea. The valley also offers many hiking trails, a very nice one being the hike to the Cascante (the waterfalls) in Mendatica. Monaco - the city of the bold, the beautiful and the rich. The principality doesn’t just offer its famous casino and harbour with luxurious yachts, but the Prince’s Palace, the wonderful Jardin Exotique and the maritime museum, all of which are also worth a visit. Pigna is the last “large” town and was at one time one of the most important towns in the Neriva Valley (behind Ventimiglia). The old town is highly picturesque with its narrow and mostly covered alleyways, called chibi by the locals. A truly worthy experience is the climb up to the grotto of Giachéira e del Barràigo. The view of the Castel Vittorio is unforgettable. If you would like to find out more about Pigna and its history and culture, then a visit to the Museo Etnografico in the town centre located near the San Michele Church is a must. There is also the opportunity to spoil yourself in the thermal baths and the beauty farm (Pigna Antiche Terme). The Pista Ciclabile is a former railway line, which was converted into a 26 km long bicycle and pedestrian path. You will be driving along the Mediterranean Sea and passing by many small and nice villages. The paved road is flat and to drive very pleasant. On the route from San Lorenzo al Mare to San Remo you can wonderful explore the picturesque landscape. At a leisurely pace it is about 2 hours on the road. On the route, there are a variety of bike rentals as well as associated parking for your car. We have compiled for you a route to make your journey as easy and enjoyable as possible. Grasse is known for its perfume museum, but this little city has a lot more to offer. Even though the town is over the border, it still exhibits Italian flair. The old city is located on a slope and as you walk through the tight alley ways you will see alternating ruins and beautiful old houses. But the main attraction is in the many perfume stores and factories, which are definitely worth a visit. Tours are offered in a variety of languages, and if you would like to see how it is all made, visit the parfumeur Fragonard next to the museum. Enjoy Grasse as it should be, immersed in a world of intoxicating smells. At the end of the Val Varatella, shortly after Toirano, you will find a large promontory of grey dolomite. In its many jagged ridges you will find over 50 caves and grottos, which are a magnet for geological researchers. The caves here in Toirano, which were opened to the public after some construction work in 1953, are managed by the municipality and are one of the biggest tourist attractions of the Riviera di Ponente, with over 150,000 visitors a year. The largest aquarium in Europe has over 10,000 square metres of exhibition space and is home to more than 600 different species of marine life. Enjoy an exciting journey through our oceans and across the aeons, starting with the beginning of life, and culminating in such pressing contemporary concerns as our endangered ecosystem. If you think that it is impossible to see whales and dolphins in the Mediterranean Sea, surprise yourself with a trip! From April until November you can enjoy this incredible experience on a boat that leaves from the ports of Imperia, San Remo, Genoa and many more. Don´t miss this interesting historic sailing regatta in Imperia! Every two years, in September, hundreds of beautiful historic and classic boats meet for 5 days in the harbour of Imperia on the occasion of the most important Italian boats’ meeting. In Liguria there are several different museums and collections to discover. Have a look at the list we have prepared for you and you will certainly find something that arouses your curiosity. Spend memorable time with your friends and family in one of the leisure parks in Liguria! Upon visiting the Le Caravelle water park the children will wonder at the waterworks therein. The older boys will definitely enjoy running on the famous Go- Kart track or forget their worries while climbing trees and taking in every adventure in the Val di Vara climbing park. This city, which boasts many extravagant gardens and villas, definitely earns its title of the heart of the Riviera dei Fiori. With one of the most famous casinos in Europe, and the year-round Italian music festival in the modern theatre, it makes for a very popular destination. 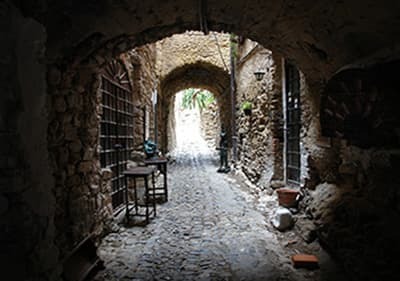 In contrast to the luxury hotels and elegant boutiques of San Remo, located just above is the town of La Pigna, which has quaint narrow alleys, inaccessible by car, that beg to be explored. A walk to the magical Giardini Regina Elena will reveal a wonderful view of San Remo and a vision of how the Riviera used to be. In a chestnut forest near the end of the Tanaro Valley lies Garessio, nestled on the piemont side of the Apennines. This town was here when the Romans were ruling. The commune became autonomous in the middle ages and all of its laws were written down in the “Libro della Catena”, and they have their own laws preserved in the so-called “Book of Chains”. Garessio is made up of four burrows, each rich in their own respective history proudly displayed in the many churches, medieval houses and great Palazzi. A silver bright sea and the warm sun rays of Liguria! These are the eternal memories experienced after one has spent one day in a boat ride in the adventure city. Experience the city in another perspective! Take a look at our list of our boat ride services at boat rides in Liguria or Isola Gallinara-Tour. Villa Grock presents an extravagant clown style. Having been conceived and established by a famous international artist, Adrien Wettach added his own personal imagination in the whole establishment. In the Villa, one gets to see the Museum with many different rooms. The Villa is recommended to all both young and old.